Have a look over Full TiltTable and just below of that find – How to Navigate Full TiltTable? Use Full Tilt Poker filters to find the Table Listings. Next, you simply need to select your preferred poker table from Full Tilt Poker Table Listings. Once you have opened your preferred Full Tilt Poker Table, click any of the open seats at the table. Now, you will see a pop up window asking you the amount that you want to buy-in for. When you join a Full Tilt Poker Table, you have two options: either you post the big blind at once, or wait until the big blind reaches you. At online poker play, we suggest you to wait until the blind reaches to you, as you are simple paying additional blinds, if you prefer to play early. As you post the big blind, your hole cards will be dealt. Once you have posted the big blind and got your hole cards, you need to use some “preselect” buttons at the button right of Full Tilt Poker Table. If you use a preselect button, then on your turn, the Full Tilt Poker software will automatically make whatever you have chosen. If you don’t use a preselect button, the poker table will pop up on your screen while it is your turn. Hand history replayer is used to watch replays of previous hands so that you can get anything you have missed. To launch the hand history replayer, click the “Last Hand” in the top left corner of the Full Tilt Poker Table. Now you can watch the visual replay of any hand by clicking the “Play” button at the button right of the screen. 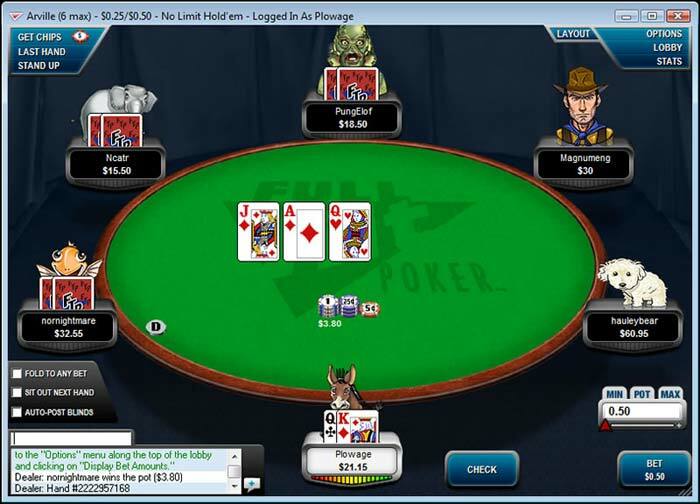 At Full Tilt Poker, you can watch the last 100 hands in the visual replayer. Use the “Stats” feature of full tilt poker to watch how many times you viewed the flop, turn, and river, how many times you went to showdown, and what percent of pots you won at different stages in the hand. See Full Tilt Poker Stats by clicking the “STATS” button at the top right of the screen. Full Tilt Poker Chat Box is located at the bottom left of the screen. Use chat box to communicate with other players at the Full Tilt Poker Table.